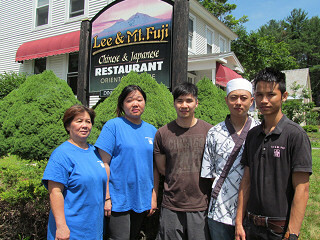 Lee & Mt Fuji Restaurant is located at 314 Main Street, Marlborough, NH. Our restaurant offers a wide variety of Chinese food such as Moo Goo Gai Pan, Curry Chicken or Beef, Shrimp with Lobster Sauce, General Tso's Chicken, Curry Casserole (Malaysian Style) and much more. We also offer a delicious menu of Japanese Cuisine ranging from Sushi to Udon, Tempura, Rolls and more. We invite you to enjoy our food and service today. Come in for our Lunch Special or during evenings for a delicious Authentic Chinese or Japanese food dinner. We also invite you to inquire about our catering!